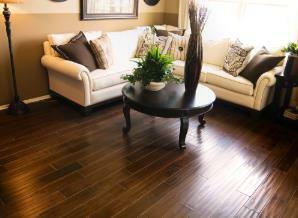 Hardwood floors are beautiful, and the better you take care of them the better that they will age and last. But hardwood floors need some special care that goes beyond using a mop or a vacuum to clean up. Today, we are going to take a look at some simple ways that you can take better care of your wood floors so that you can keep them looking great year round. You don’t have to be 100 percent strict about this policy, but the better you keep it, the better your floors are going to look and last. There are so many different hard shoe bottoms that can scratch hardwood easily. Make sure that anytime you come in the house to take off your shoes and put them somewhere handy. One of the best ways that you can help take care of your hardwood floors and remember to take your shoes off is to put a shoe rack right inside your front door. You may even want to put doormats outside and inside of every entrance to your house to make sure that you get any excess dirt, debris, or mud off of your shoes before entering the house. You can sweep or vacuum your floor as regularly as two to three times a week, or more if your schedule permits it. Use a microfiber mop and a pH neutral cleaner to wipe up dirt that is stuck to the floor. You want to keep the cleaning solution that you use simple, and avoid any cleaners that use the verbiage “rejuvenate” or “shine.” Those products will usually contain chemicals that will fade and harm your floor. 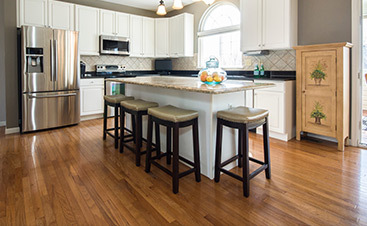 Did you know that hardwood floors have an ideal temperature range for longevity? Hardwood floors maintain the best when they are kept between 60 and 80 degrees, with anywhere from 30-50 percent humidity. This is the ideal temperature and humidity range to keep your boards intact so that they don’t split or buckle. 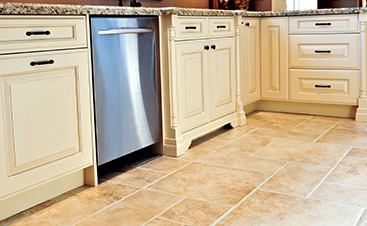 Changes in temperature and humidity can cause your floor to warp and move around. If you have pets, one of the most important things that you can do for the health and maintenance of your hardwood floors is to make sure that their nails stay trimmed. Long pet nails can easily deteriorate and scratch up your floor. Also, make sure that you keep your pets cleaned and bathe them regularly. You may even want to wipe their feet down when they come in from the outdoors because they can track in dirt and debris that can damage and dirty your floor. Another way to make sure that you keep your hardwood floors looking great for longer is to clean up your messes quickly. If you spill any food or beverages on your floor, clean them up as soon as possible, especially if they are sticky or contain a lot of sugar. If you haven’t used ice before to help clean up sticky materials, you are in luck. Ice is perfect for hardening sticky materials like gum or wax. You can place ice on or rub ice on sticky substances until they become hardened and retract, and then you can use a plastic scraper, spatula, or credit card to scrape the material off of the floor. Vacuuming your hardwood floor is another way to make sure that your floor stays clean and looking great for longer. Make sure that you use a soft attachment on your vacuum so that you don’t scratch your floor while you are in the process of cleaning it. This will help clean up debris and mess that can scratch up your floor if left unattended to. Another preventative measure that you can take to keep your floors clean and scratch free is to use furniture pads under the legs of your furniture. This will help you move your furniture without scratching your floor when you need to clean. It also just helps you keep from scratching your floor when you want to move your furniture around. 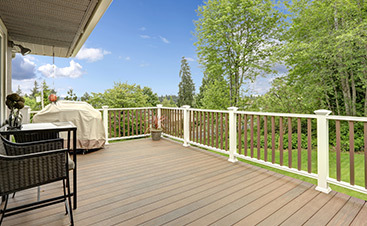 Now you have some effective methods for maintaining your wooden floor all year round. This will help keep your hardwood floors clean and attractive. Wear and tear is inevitable with traffic and ongoing use. A professional can refinish your hardwood floors to extend their life and make them look like new.